Like devices by Amazon and Google, Apple's HomePod speaker can respond to questions and control smart home gadgets such as lights. Dave Lee's review: Superb sound, but how smart? "Apple is being very clever by launching its Siri speaker as a music speaker that's smart, because Siri isn't great," said Tom Warren from the technology news site The Verge. "Interesting that home assistant was the last feature they talked about. Focusing on music is smart, main use case for smart speakers," said Ben Bajarin, of the Creative Strategies consultancy. The announcement was made at the tech giant's Worldwide Developers Conference (WWDC) in San Jose, California. 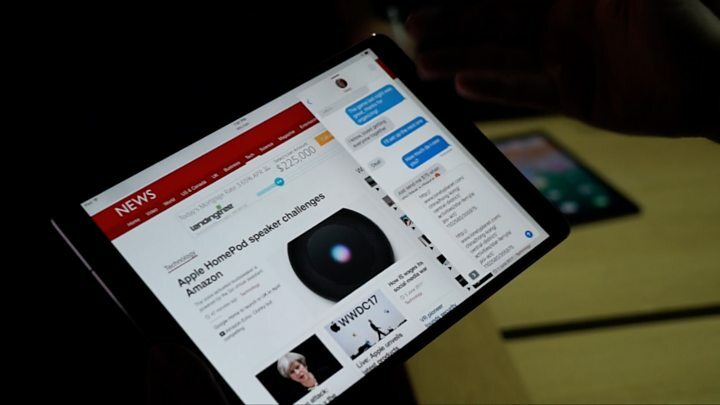 "It's a logical step for Apple, to ensure that they don't miss the opportunity to get a smart device right in the centre of people's homes," said Ben Wood, an industry analyst at CCS Insight. "There has been a huge amount of hype around Amazon Echo and Google Home, but we are really at the start of this technology. "This does a great job of extending the tentacles of Apple services." At more than double the cost of Amazon's Echo, the HomePod is a typical Apple move. 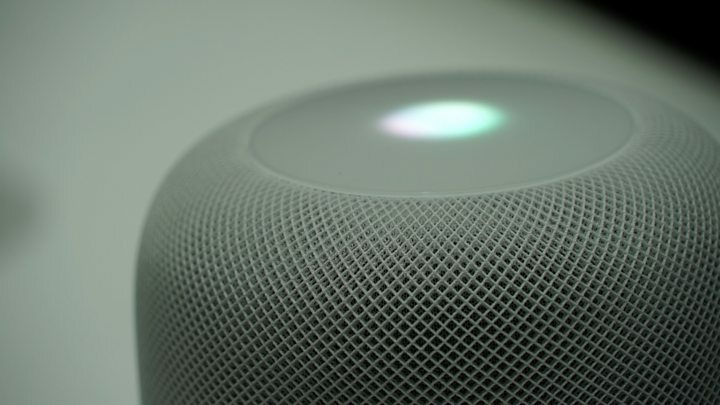 What's interesting about Apple's approach here is that the company has positioned HomePod as a music device first and foremost, a big contrast to the approach of Google which touted its Home speaker as a day-to-day assistant for many aspects of your life. So - a cynic might say Apple has just launched the world's most-hyped bluetooth speaker - not much imagination there. But let's face it, before AI and machine learning really matures, most home assistant devices are essentially voice-controlled speakers, and so Apple dedicating its effort into making it sound great is probably a smart move. Then again, you might wonder if its "smart" capabilities are being downplayed due to Siri just not being as advanced as its competitors. Tools that let app designers add virtual objects to a real-world view from the phone's camera, in real time, were also revealed. The mobile game Pokemon Go is a well-known example of mixed-reality technology in action. Apple said the new ARkit would make use of the dual-lens camera on the iPhone 7 Plus, making the integration of virtual objects and the real world more realistic. "By truly enabling all modern iPhones to become augmented reality platforms, Apple will have the largest potential reach for AR development day one," said Mr Bajarin. However, he questioned the practicality of augmented reality on a smartphone. "The benefit to a headset or glasses in these demos is not having to hold the device up thus arms getting tired," he said. Apple also announced the next version of its mobile operating system - iOS 11 - which will include a new setting for people who use their iPhone in the car. In January, the company was sued by a US couple whose daughter was killed by a driver allegedly using FaceTime on his iPhone. The new driving mode silences notifications, turns the phone's display off, and can automatically reply to messages to warn friends that you are driving. Samsung is testing a similar feature for its Android-powered phones.